It is a known fact that Riteish Deshmukh and his wife Genelia D’Souza Deshmukh love social media platforms. While the two often shower love on each other with their cutesy posts, recently they shared an adorable post about their son Rahyl. Recently, Minister of Youth Affairs and Sports Rajyavardhan Singh Rathore gave Fitness Challenge to the youngsters of the country in order to promote the importance of maintaining a healthy lifestyle. And their second born, Rahyl, who is just two years old, decided to take up the challenge. Well, we got a sneak peek of the fitness challenge taken by Rahyl Deshmukh wherein we see the little kid doing rock climbing. Accompanying him in the challenge are also his doting parents, Genelia D’Souza and Riteish Deshmukh. 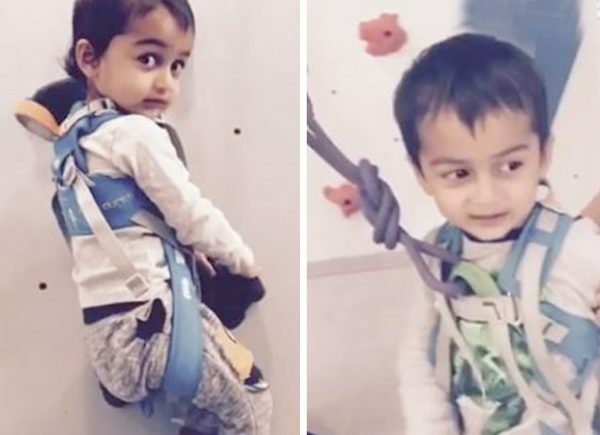 Genelia took to Instagram to share a video of Rahyl’s fitness challenge and how he has been trying his hand at rock climbing. Post the same, Rahyl also decided to give the fitness challenge to his fellow Bollywood bachha gang. Riteish Deshmukh and Genelia D’Souza are proud parents to two kids. While their elder son Riaan was born in November 2014, Rahyl was born in June 2016.